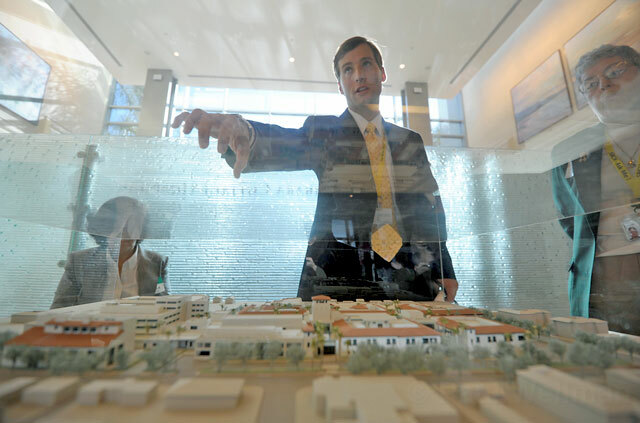 With Friday’s late morning sun shining straight down Castillo Street and filling the new Santa Barbara Cottage Hospital with warm light, more than two dozen members of the media were offered a tour of the biggest, most expensive building project in Santa Barbara’s history. The state-of-the-art facilities house fresh equipment and technology, reimagined private rooms, and passive strategies to promote healing, like artwork, natural elements, and creature comforts. 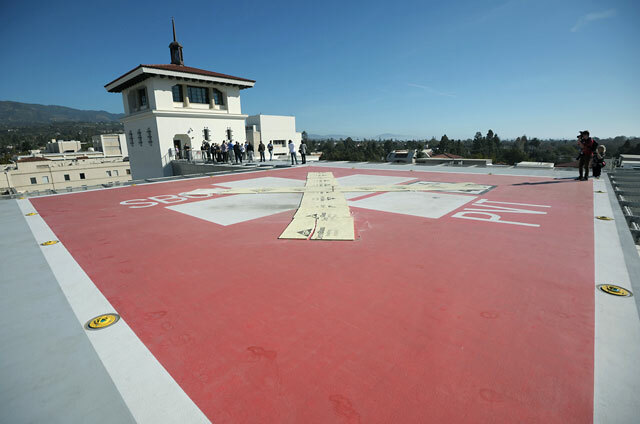 And the helicopter landing pad, which is undergoing tests and licensing, will connect Cottage by air with other trauma units throughout the state. 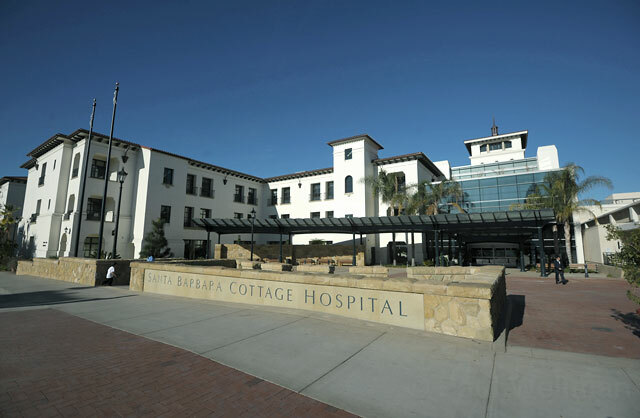 “It really is for Santa Barbara, I think, a new day in health care,” said Ronald Werft, president of Cottage Health System, explaining the hospital’s whole design centers on patient care and that increasing privacy was a main focus. “It’s really developed from the point of view of the patient,” he said. Those under Cottage’s care will shift to the new facility on February 12 during a highly choreographed, six-hour move. The three new buildings, or “pavilions” — which cost $305 million and encompass 370,000 square feet — represent the fourth of seven construction phases. During the last few phases, a structure will be knocked down and another built to connect the new and existing campuses. That last step is scheduled to wrap by 2017. The three-story pavilions house 203 inpatient rooms, grouped by noncritical care, intensive care, and maternity areas. As the media crowd gathered in one of the noncritical care rooms, Nathan Sigler, director of Transition Planning, explained that while the existing hospital contains only 30 percent private rooms, the new hospital will offer private spaces to more than 90 percent of its patients. Each noncritical care room — spotted with wood paneling and decked in tasteful, IKEA-esque décor — has a visitor area with a couch that expands into a twin bed. Visitors can separate their area with a curtain if they wish, and patients can keep their door closed for privacy. Nurses, Sigler explained, are able check on them by looking through a window. Along one wall is a flat-screen TV on which a patient can watch educational videos about their condition, treatment, and discharge. It’s also hooked up to the Internet and navigable with a wireless keyboard. Patients are able to order room-service meals complete with customizable, à la carte entrées delivered at a specified time. The detailed menu features Our Daily Bread baked goods, Givens Farms produce, and Rancho San Julian beef. The new system is currently in use at Goleta Valley Cottage Hospital, said Werft, and is a big hit with both patients and visitors, who can pay cash for their own meal. The program cuts back on waste, said Werft, and includes over 50 different therapeutic diets. 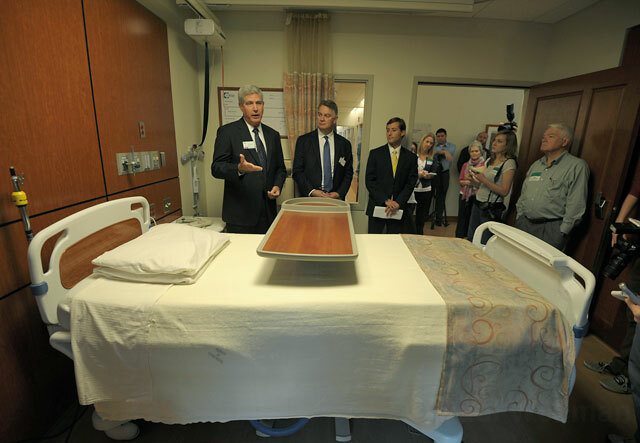 Not to overlook the actual medical equipment, Sigler pointed to the rooms’ new patient lift system, built into the ceiling and designed to more easily cradle and move a person as they shift from the bed to a gurney. The beds themselves weigh patients, offer pulmonary therapy, and ask “yes” or “no” questions in more than 130 languages to gauge comfort and pain levels. Bathrooms are now more navigable and user-friendly, and much time and energy was spent choosing the perfect patient chair, said Sigler, with the winning model featuring little-resistance reclining backs, locking wheels, and arms that drop down. “Every amenity has been thought through and vetted with our nursing staff,” said Ron Biscaro, vice president for project management. Werft noted that as the rooms were being designed, a mock-up was created for staff to critique. Nurses were given Post-It notes and asked to stick them on objects or areas they thought needed improvement. By the end, 600 Post-Its dotted the room, and many of the recommendations were incorporated into the final design, Werft said. Nursing stations also have coffered ceilings to help with noise-reduction during busy hours, he went on. 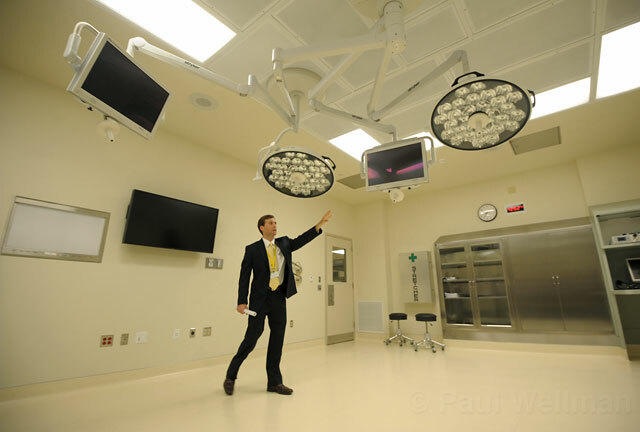 The surgical intensive care and medical intensive care units each have 20 rooms and include many of the same amenities but with a different layout to accommodate a ceiling equipment boom. Numbered 1-16, without a number 13, the operating suites sport minimally invasive and robotic surgery machines hooked up to a touch-screen system that controls overhead lamps and video monitors. The air inside the rooms is completely replaced 40-60 times an hour to reduce the risk of infection. The maternity area includes 12 birthing rooms that look and feel similar to noncritical care rooms but feature a Jacuzzi tub that can be used during labor. 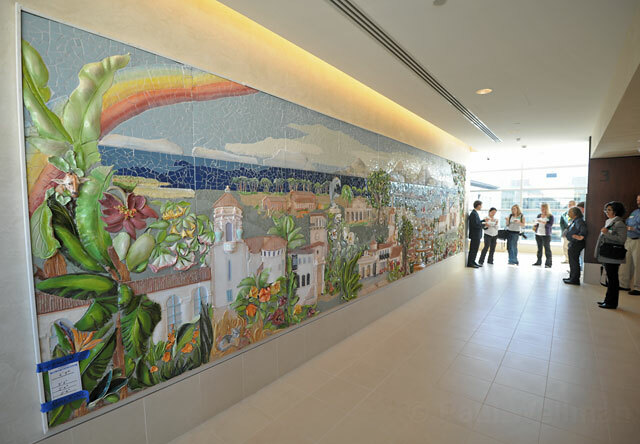 Cottage Hospital, representatives were proud to point out, is decorated with the largest collection of artwork created by living Central Coast artists. As part of the Healing Arts Program, over 400 artists were invited to submit samples of their work; 123 were chosen, and more than 1,200 pieces will be acquired for the system-wide program, including the Goleta Valley and Santa Ynez Valley campuses. The mediums vary and include paintings, photographs, sculptures, mosaic, and glass. It’s believed, said Sigler, that exposure to visual art can lessen the use of pain medications, increase compliance with treatments, and shorten the length of hospital stays. 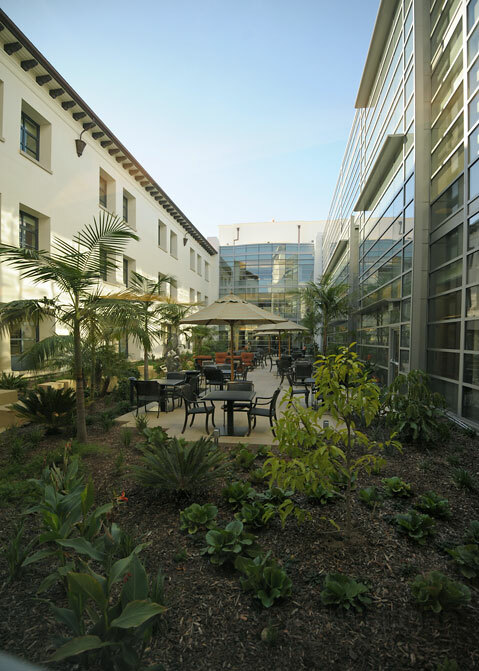 The Santa Barbara campus divides its floors by theme, with the first floor devoted to architecture, the second to water, ocean, and seascapes, and the third to flowers and floral motifs. Also new is a nondenominational Sacred Space, a carpeted room with soft lighting and a high skylight that patients and visitors can walk through whenever they wish. There will also be services and programs available and the entranceway will display holy objects from a variety of faiths. 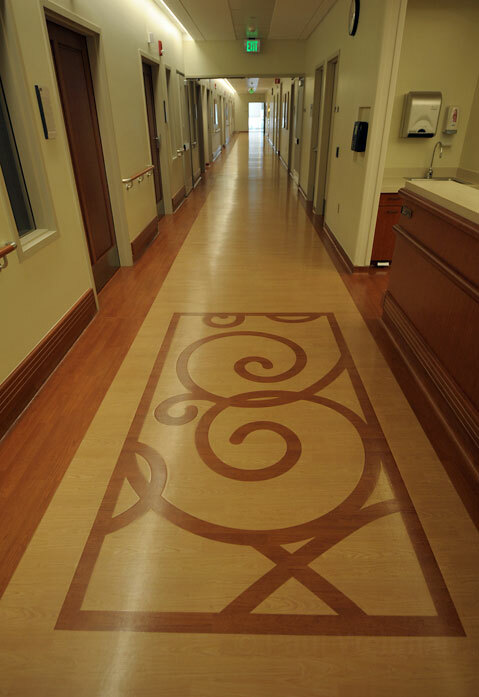 Snaking through the lush, expansive courtyard of the hospital is the River of Life, a water element that begins in the lobby and fills the area with a soothing sound. Atop one of the new pavilions is Cottage’s helicopter landing pad, an unfenced concrete square that offers one of the best views in Santa Barbara. The hospital is currently contracted with CALSTAR (California Shock Trauma Air Rescue) to transport patients in and out of the Level II Trauma Center, but is talking with other air ambulance companies as well. Operational but still in the testing phase, the pad will see around two landings per week. There have been a few tests so far without any noise complaints from neighbors. Helicopters follow a specified flight path along the freeway and over Junipero Street to disturb as few residences as possible. County Fire is set to test its Hueys on the pad in the next week.